Regrow overplucked brows! 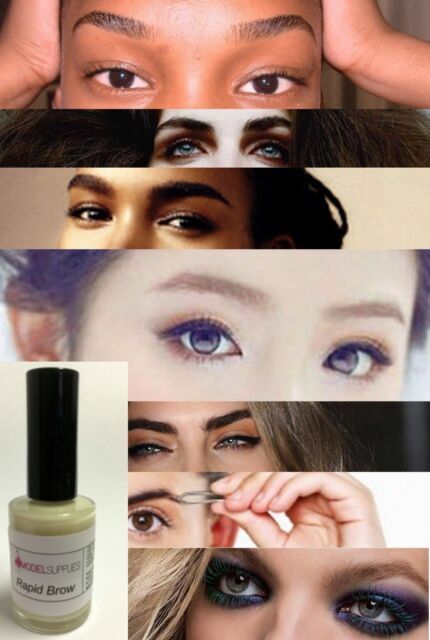 You don't need to go to Paris to get great brows. As we age, the brows do not grow in as full as they did in our youth. It is important to keep our brows conditioned and full if we wish to convey vitality to the world. "Loving this eyebrow growth serum!" I was not aware that eyelashes mattered as much eyebrows. I first purchased this product to help fill in my brows; seeing that it could be used on lashes too, I decided to see how quickly my lashes could grow as well. Since beginning usage of this product through a span of a month, I have seen my lashes and brows fill in quite nicely and saw results that were indeed rapid. I've heard that it takes time to grow eyebrow hair back as it tends to grow slower than most, but using this product i have seen my eyebrows grow in fuller in as little as a few days. A little over a week and the hairs began blending with the pattern of my already existing brows. The Modelsupplies Rapid Eye brow/lash Growth Serum along with the Rapid Hair Growth Serum are quite the collection, thank you so much! I read good reviews which made me decide to try, it didn't help mine, has good ingredients, but my eyebrows are light this made them even lighter , almost like I didn't have any, I color my eyebrows just because they are so light. not sure how it helped others, I don't recommend cause it doesn't help me, but some one who has decent eyebrows might get a good outcome. oh yeah I wont put it on eye lashes, it burns. As good as it gets, at this point in time. The product just seems to work. I began using said product, and began to notice increased density, in my eyebrow area. Actual growth was noticed in about ten days. Not heavy growth, but hair began to appear. All I can forward is, Thank you. This is the second time using this product and it has worked wonders for me. I apply it every night sparingly and already new hairs are sprouting through. Will buy again when bottle is finished. Also helps with thinning edges too.